08001 is #3 on Mondosonoro Best of World Music albums of 2013! 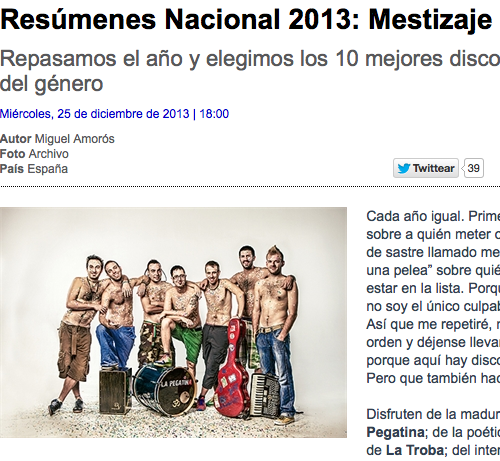 The band and their album No Pain No Gain, presented at Mercat de las Música de Vic in September received very good reviews from critics and the audience, it's #3 of the Best of the Year, along with La Pegatina, La Troba Kung-Fú, Tomasito. Plus the single "Children Rise" gets #42 in the 50 Best tracks of the year composed by all Mondosonoro national editors. Hopefully 2014 comes with a full agenda of confirmed dates.